( See https://norfolkpilgrim.blogspot.com/2010/07/south-elmham.html and the matching https://norfolkpilgrim.blogspot.com/2010/07/north-elmham.html). Bishop Herbert built two matching churches, each with the same ground plan at both North and South Elmham. 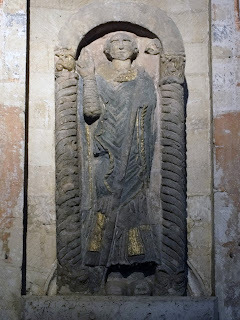 Recently, I have been puzzling the relief sculpture of St.Felix in Norwich Cathedral. It was part of the furniture around the Bishop's Entrance in the North Transept. Both the sculpture and the architecture around the door were deliberately antiqued to look old even when they were new! This latest round of puzzling is connected with The Norfolk Saints' Way , one of Norwich Cathedral's Green Pilgrimage projects. Along the route from Burgh Castle are two churches, at Reedham and Loddon, that were founded by St.Felix. Yes, I know he never came here but......... I have been revisiting the arguments of the Reformation. The echos of the bad tempered arguments are visible in - broken 7 sacrament fonts, a few remaining pieces of medieval glass, rood screens where the saints faces have been scratched out and empty niches once occupied by the images of saints. In some ways St.John of the Cross was a Reformer too and he got a lot of grief because of it! When I think about him as a bare foot friar, I am reminded that John Wycliffe had four such friars supporting him when he appeared before the Bishop of London. I find it a very odd thing that the Norfolk Saints Way on its way into Norwich Cathedral has Lollards' Pit as a way station. I wander what the Lollards might have thought about 21st Century pilgrims! In their day they were dead against it. On this feast day of St.John of the Cross I remember a trip I made to walk in his footsteps! I think I am right and that this (unlabelled) photo is the view looking south from the site of his Los Martires Friary looking south towards the Alpujjas. Granada was the last city to be re-conquered from the Muslims. The Alpujjaras the last part of Spain ruled by Muslims! It is a site just round the corner from Grenada's beautiful, Islamic gardens of the Alhambra and the Generalife. It seems to me that John uses poetry to reach out to newly converted Muslims by using Song of Songs imagery which was accessible to Christians and Muslims alike. In one of the last stanzas of the Song of the Soul and the Bridegroom. He gives more than a hint of the time and place of its composing We shall go at once To the deep caverns of the rock Which are all secret, There we shall enter in And taste of the new wine of the pomegranate. In Spanish the word Pomegranate is Grenada .